Invited presenter at the Brain Workshop on Treatment Envelope & Simulation in Charlottesville February 2-3. Presented advances made on using 3D patient-specific simulations for patient selection for tcMRgFUS. More on the workshop here. Presented my work on Patient-Specific Models for Transcranial Magnetic Resonance Guided Focused Ultrasound Surgery to the Vice President Joe Biden. Presentation at the California Academy of Sciences on Focused Ultrasound Surgery in the Brain to treat movement disorders and brain tumors. The presentation was selected by a panel of experts at Stanford from submitted applications from Postdoctoral Fellows from across the Stanford School of Medicine. 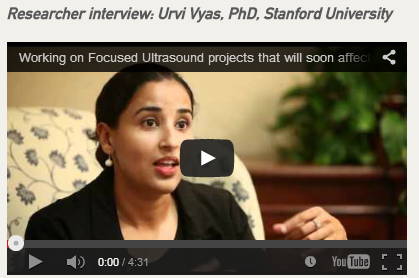 Funny interview after the presentation titled- Urvi Vyas: Ultrasound tumor Killer. 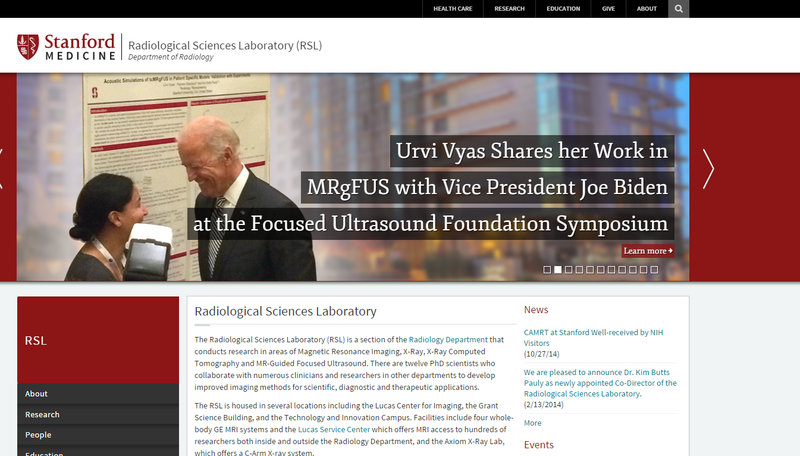 An article and interview about receiving the Young Investigator Award by the Focused Ultrasound Surgery Foundation and my work at Stanford.